You have the perfect home with someone who really loves you. You had a bad start being chased by a cat, but things turned out great. Greetings, Baby! Happy Pet of the Day to you, from all in this wheeker loving home! 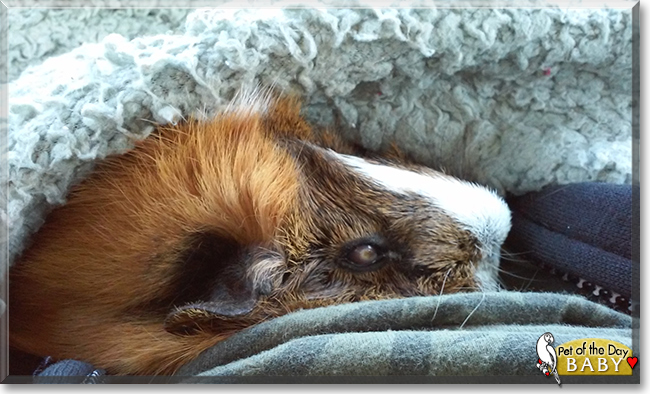 As a long time guinea pig lover and mom, your mom's heartfelt, love filled tribute, your inspirational, life affirming back story brought tears to my eyes!!! To say you are a fighter and survivor of epic proportions, that your devoted mommy is a hero, would be an understatement! Endless thanks to your mommy for sticking by you through all of your health challenges, doing everything in her power (along with your vet) to heal you! I've been there with more than a couple of my pigs, receiving that scary diagnosis, devoting countless hours to their care and recovery, so can well understand what your mom has been through. But in the end, her time and commitment, the medical expenses, a small price to pay for your unconditional love and devotion, the happiness, comfort and healing you have brought to her life! The only question that needs to be asked is just who rescued who? You certainly had a scary start at life, sweetheart, but thanks to that dear lady who rescued you, with a little help from Craigslist, your dream of a loving furever home came true! What a wonderful team, fighters both, you and your mommy make; best friends and soul mates for life! Endless thanks to your mommy for sharing your and her heartwarming love story with us! Meeting you today has been a joy! You truly are a treasure, Babygirl, beautiful inside and out, your mommy's Pet of a Lifetime!!! Hope you're enjoying a very special Pet of the Day celebration...munching the yummy fruits and veggies of YOUR choosing, hehe, cuddling with your mommy, being loved and pampered to pieces! Lots of love, snuggles and kisses to you, beautiful Baby, our very special and most deserving Pet of the Day, EVERY day! Dearest Baby, you are absolutely precious! You're utterly adorable in those great pictures, and what an amazing story you have to tell! You and your dear person came together through fate and Craigslist when you each needed each other so badly. You have formed the deepest bond together and mean the world to each other. You love each other so very much, don't you. What a wonderful love-filled home you share! 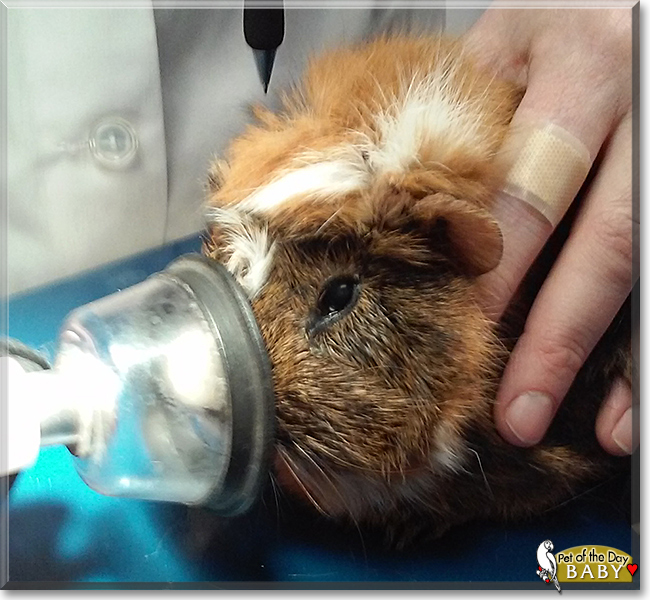 Congratulations, darling Baby, on being chosen today's Pet of the Day! We hope you and your dear person and all your family and friends are enjoying a fine celebration, full of fun and lovies and all your favorite games and treats.